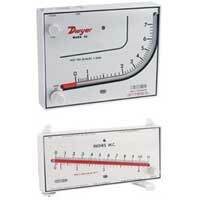 SERIES MARK II Molded Manometers are of the inclined and inclined-vertical types. The curved inclined-vertical tube of the Model 25 gage provides higher ranges with more easily read increments at low readings. The Model 25 is excellent for general purpose work. 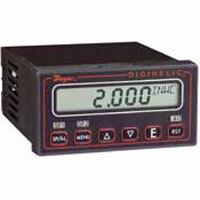 The Model 40 inclined gage provides linear calibration and excellent resolution throughout its range. 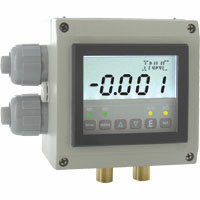 The Model 40 is ideally suited for air velocity and air filter gage applications. Both gage types are capable of pressure measurements above and below atmospheric as well as differential pressure measurements. Included with each Mark II manometer are two tubing connectors for 1/8" pipe or sheet metal ducts, two mounting screws, 1 ounce bottle of indicating fluid, red and green pointer flags and complete instructions. The Model 25 also includes 8' of flexible double column plastic tubing. Portable operation of the Model 25 is made possible by the use of the optional A-612 portable stand. A short piece of tubing can be slipped over the Model 25 pressure connections to contain the gage fluid in transit. The Model 40 contains two 4-1/2' lengths of clear plastic tubing, a plastic swing-out stand and leveling screw for portable operation. It also features convenient rapid shutoff pressure connections and integral overpressure safety traps. Click here, if you require a Safety Data Sheet for the Blue Gage Fluid or the Red Gage Fluid. OEM Specials - All Dwyer® Mark II Molded Plastic Manometers can be supplied in OEM quantities with your name and special graphics and scale. We have a Dwyer gauge Mark II 25 on a waste oil furnace. Can you tell us how much heat it will withstand if we should get it too close to the heat source or how hot the gauge could get before readings would be incorrect. The maximum temperature the Mark II 25 can be exposed to is 140 degrees F since it has many plastic components that cannot withstand direct heat. Could you confirm the instructions on setting the zero setting on Dwyer Model Mark II 25. I have two different instructions and want to know which one is correct.